Turf, Tree, and Landscaping – Application of several gallons of product intended to control widespread infestation of a variety of insects. Ideal for the control of insects in the turf and outlying areas of your property such as fleas, mosquitos, ticks, chiggers, and springtails. 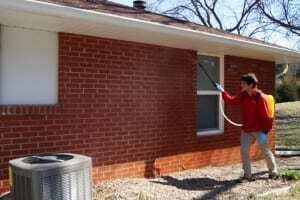 Structures/near-foundation landscaping – A coarse application of 4 gallons of product intended to control widespread infestation of a variety of insects that collect on your bushes, mulch beds, downspouts, eaves and soffits. Perfect option to prevent Carpenter ant infestation in your home or business. Collect and cover all kid’s and pet toys from the areas to be treated: Entire yard, under decks, areas with foliage, under trees, etc. Consider mowing the day before the application. APPLICATION IS RAINFAST AND SAFE FOR PETS AS SOON AS IT IS DRY depends on the day. Tip over or throw away and receptacle that will hold rainwater or collect condensation or dew. Items as small as a pop bottle lid or empty aluminum can are enough to support mosquito larvae. Minimize or limit all standing or stagnant water in rain barrels, ornamental ponds, bird baths, watering cans, children’s toys, etc. Anything that can fill up with rainwater should be tipped so it drains or turned over so it won’t collect water. 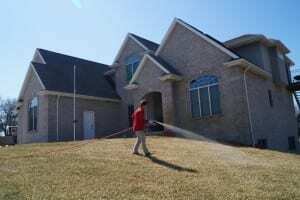 We are locally owned and operated company specializing in residential and commercial pest control. Spiders, ants, termites, mice, and other rodents are just a few of many pests we professionally exterminate in the Lincoln and Omaha area.